The set consists of a OneWay ShowerLay with integrated and waterproofing linear drain. Dimensions of drain channel: 500mm long and 80mm wide. This set comes also with siphon trap with flow rate 26 l/mm and waste pipe diameter: 1,5". Invisible is a specific drain type without vertical frame, making it suitable for range of finish materials, from vinyl to marble and stone. Grate is flushed with the frame, so there is no requirement for finish material height, although channel protrudes below the bottom shower tray surface for 10 mm. Special degreasing cloth is included to clean the steel surfaces before gluing the finished floor surface. Steel is finished with brush, which is practical and particularly suitable for most architectural applications. This tray is one of the smallest size of shower tray that we provide. It requires little space, making it suitable for most showers even in small bathrooms. OneWay Fall Showerlay Wiper 800x800 Line Invisible is a must-have for modern bathroom design. 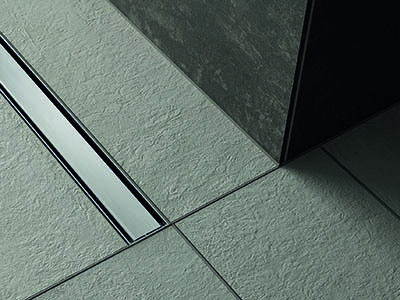 Square metre walk in shower tray comes with one of most popular 700mm linear channel. It is fixed to shower former and sealed against water. Other necessary parts are also included, such as suitable grating and waste siphon with water seal height of 20 mm and flow rate 26 l/min. Pure is a slot cover, should be filled with tiles so after the installation only visible part of the tray would be the channel. It is made by McAlpine and can be easily connected to standard pipework. Former comes with integrated and waterproofed stainless steel linear channel, which offers good corrosion resistance to both chemical and atmospheric exposures, with a high resistance to oxidation. In the set there are also suitable McAlpine siphon and grate. Drainage is 500 mm long and 80 mm wide while grating width is 64 mm. It protrudes above the shower tray for 15 mm and below for approximately 5 mm. Pure is a slot cover, should be filled with tiles so after the installation only visible part of the tray would be the channel. Steel is finished with brush, which is practical and particularly suitable for most architectural applications. By choosing the OneWay Showerlay you will avoid diagonally cuts in your tray. 800 x 1200 mm pre machined tray is the smallest rectangular walk in shower flooring we can supply. It requires a little space making it suitable for most showers even in small bathrooms. A wet room has the potential to be a true work of art, where functionality meets elegance. By choosing OneWay Showerlay you will get also integrated and waterproofed stainless steel linear channel, suitable McAlpine siphon trap with 26 l/min capacity and grate. Drainage is 500 mm long and 80 mm wide while grating width is 64 mm. It protrudes above the shower tray for 15 mm and below for approximately 5 mm. Pure is a slot cover, should be filled with tiles so after the installation only visible part of the tray would be the channel. Steel is finished with brush, which is practical and particularly suitable for most architectural applications. High quality, suitable shower drainage is included to former, it comes with 600 mm long steel linear and drain. It also comes with grating which is 64 mm wide, leaving 8 mm wide channel for water to flow. Pure is a slot cover, should be filled with tiles so after the installation only visible part of the tray would be the channel. Height from the shower tray surface to the top edge of vertical upstand is 15 mm, it also goes below the tray for approximately 5 mm. McAlpine siphon trap with capacity of 26 l/min. Waste can be rotated and it's height adjusted giving much flexibility during installation. Showerlay is complete unit with everything you need. In the set there are suitable shower drainage, it comes with 600 mm long steel linear end drain with grate (Pure slot). It also comes with grating which is 64 mm wide, leaving 8 mm wide channel for water to flow. Pure is a slot cover, should be filled with tiles so after the installation only visible part of the tray would be the channel. This is perfect linear channel for tiled floors, as the lip height is 15 mm. It also goes below the tray for approximately 5 mm. McAlpine siphon trap with capacity of 26 l/min and 20 mm high water seal is also included. Chat started. Session ID: 1556252987. You are now connected to: David M.